how about a complete working source code example? This post contains the code that would go into the Form1.cs file. No other jingle bells associated. I did reformat the code here on this page you for, please see step 1 and step 2 above. Let me know in case you would still want a complete .sln based solution files. Would be glad to help. But that no longer works. I know it is because of IOleObject, just not sure how to solve it. The above MSDN reference has a sweet example which I'm sure would give you better understanding. Let me know if you come across any issues; I'd glad to help. Oddly enough when on the same domain as the secured resource (SharePoint) the form will log in two users (the user specified manually in the credentials and the user logged into the machine). SharePoint shows the user logged into the machine is logged on, but if you choose "Sign in as a different user" the user specified by the form application is signed in. I can't seemto figure out why this is happening. Any ideas? Thanks for your comment Jamin. Can you be more specific as to what exactly are you trying to achieve? If I understand you correctly, your Form and secured site is on the same domain, and therefore the Form is logging in two users at-the-same-time? The form application(that is, WinForms) is "usually" unaware of the logged in user, unless otherwise is explicitly told to the application. So whatever values(userid/pwd) are going to be set as credentials in the Form, whether you are retrieving the credentials of logged in user and passing it to the Form - or - you are providing manual credentials (using config file or something), shall be forwarded by Form to the secured site. 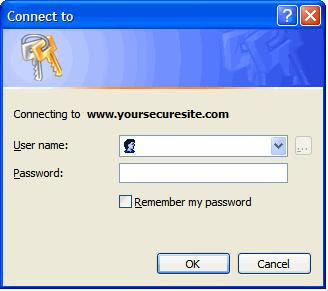 Secured site shall always be unaware of the Form, it would always assume that a User has logged in. The integrated authentication process is that, when a user logs on to the domain the credentials gets verified, against the active directory, and IsAuthenticated bit in the OS is set to true[http://msdn.microsoft.com/en-us/library/aa480475.aspx]. So when a secured site, which has Integrated Windows Authentication turned on, gets a connection request, it looks for that IsAuthenticated bit; and more precisely looks for it to be "true". If that bit is false, you will be provided with the popular network credentials pop window. And then would verify those credentials against some active directory. Now in your case, you have both (Form and secured site) on the same domain. Your SharePoint must be using the integrated windows authentication; so it only looks for the IsAuthenticated bit, and thats why it is showing the currently logged in user. In that case it would not require the Form to provide credentials explicitly. For instance, when a user, for example User B, logs on to the domain successfully it becomes an Authenticated User having IsAuthenticated bit set to true. If User B opens the SharePoint page, it(the SharePoint) merely checks the IsAuthenticated bit, retrieves user credentials, the user name, and let the user log in. While in the Forms case, the Form is running under Authenticated credentials, and when you pass on the different but valid credentials to the forms, they get authenticated as well. Therefore it would work in both cases. Let me know if dragged your question entirely to 180 degrees. One more thing, just to add; In most cases we require Form to log-in on a secured site where "separate" domains are a concern; thats where we provide credentials explicitly. Or in cases where the domain is same but proxy requires a set of credentials, or for auditing reasons, etc. So, in your case when you are on the same domain why would you require your application to log in explicitly? I have seen your comments which have been great help to others. And I think you're so talented and I want you to solve my problem. and I want to use private proxies which require username and password. But for private proxies , the dialog which require username and password is displayed when I try to navigate to a page. Any suggestions will be great help to me. Hello Khey, by 'private proxies' I assume you mean different proxy for different web requests. Or if you want to the change the global proxy settings, you will require tweaking with registry settings; but this would change the proxy globally! If, at all, at any point in time you find yourself interested in digging deeper in header field definitions of HTTP protocol, this(http://www.w3.org/Protocols/rfc2616/rfc2616-sec14.html) is a good read. I'd like to use your solution in my console application. My original idea is to create thumbnail from web browser at console application. It is working fine but it didn't work with Sharepoint pages. So I looked for the way and found your solution. Your solution seems working fine. But the problem is I only get the blank image. As it is the console application, I don't have the form_load. So I put the things together in one module as the following. Do you have any idea so that this solution can work with console application? So I assume, you "do" get the pages but you do not get the images, right? Did you try loading a different website? CNN.com may be? To see if you are getting the images at all? Just a thought, it could be that you are using, DrawToBitmap() to create thumbnails, which according to MSDN(http://msdn.microsoft.com/en-us/library/system.windows.forms.webbrowser_members.aspx); "this method is not supported by this control". >It is working fine but it didn't work with Sharepoint pages. Any web page is transparent to the WebBrowser control; Sharepoint usually requires authentication before rendering any page to the user, so that might be a reason in your case. By looking directly are your requirements: "to create thumbnail from web browser"
The method I used is similar to the link you referred "http://www.codeproject.com/KB/cs/Website_Thumbnails_in_C.aspx". But this one is more effective. >So I assume, you "do" get the pages but you do not get the images, right? Did you try loading a different website? CNN.com may be? To see if you are getting the images at all? When I try the different web site, I also get the same blank image. What I suspect is because of "about:blank" browsing. When I change it to some other web site and try again, I get the image. But for the bypassing we need it, right? So, is there a way to put browsing about:blank to different module at console application and use again in screen shot module? 'about:blank' is precisely for if you are navigating to a secured(https) site. If you aren't then you may replace 'about:blank' with something interesting, or don't call it even. I appreciate your help and your good post. The blank image is because of me. I have to put the following code in WebBrowser_DocumentCompleted Event Handler. I just noticed that code in your program Today. Thanks for your post. It is working fine in windows application with web browser control. I have custom requirement in outlook Add-in developement. In my outlook addin there is no webbrowser control.I created new folder and set the shrepoint site URL as homepage URL for the folder. when we click on that folder it prompts credentionals window to check the authentication. I want to skip this authentication window and pass the credentionals programatically(like the webbrowser control). How can we do this? It is working with only webbrowser control? I tried in outlook in the follwing way, but oc retunts as null and throws the exception. Do you have any idea to avoid this credentionals window in outllok. Kiran you can try looking into intercepting the StsSync protocol that is used to enable Outlook or third party applications to sync SharePoint. Though I am not sure, just thinking out loud! Excellent job! I've been looking for this to integrate into a BHO. Is it compatible with both IE7 and IE? Thanks for the article. I am using a windows form and have the code as you have specified here. Even though I have the call to "about:blank" preceding my actual call, but still my implementation of IAuthenticate.Authenticate is not being called. Any pointers would be really helpful. We are getting blank page results sometimes when the Sharepoint webpage contaings IFRAME. Is there a way for me to overcome that? Have been studying your code for a couple of days and finally got it to work. Thank you for sharing your knowledge. I have a lot of studying a head of me as I still do not wholly understand the code, nor could I recreate it from memory. I am immensely appreciative of your expertise and generosity. I'd like to ask is it possible to use your solution in an asp.net application to redirect from a website to another website have the Basic authentication popup and escape it.... I'm really looking for days to find a solution for that problem. if yes, is there's any recommendation on it's implementation at asp.net C# web application. I follow your instructions copy/paste the code but no luck. Do you have a full solution I could download? Can you elaborate more on "no luck"? What is the error that you get? People have used this code successfully from the same file. Nevertheless, I will upload the .SLN for you, gimme some time. I open the source and paste your code. After building the first time I get all sorts 78 errors. And I use IHTMLElementRender2 (from http://www.codeproject.com/KB/cs/Website_Thumbnails_in_C.aspx?msg=2053785). After that, it is working fine. Just wanted to say thanks for providing this great information - this solution worked perfect for me to auto-log into a https site - One thing to watch out for is if you put in invalid credentials it'll load a blank page with no errors displayed! (This is because it was automatically done through the code) So if you are getting a blank page be sure to double check your credentials. What about a similar example of intercepting the Smart Card dialog if a user has already keyed in PIN and we are trying to authenticate for them at a URL. I don't see new window events when the browser object invokes the Click event.